A record eight high school seniors are projected as first-round picks, but none are expected to make the impact of last year's No. 1 overall pick. LeBron James' career as a Cavalier officially started Thursday night as the overall No. 1 pick. 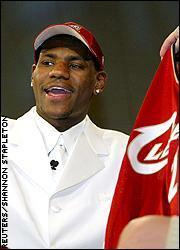 Just call it Jamestown: The city of Cleveland is already in a frenzy over its hometown hero LeBron James. No, Cleveland didn't receive the top marks from ESPN Insider Chad Ford. Who did? General managers gave it the old college try by selecting nine seniors in the first round of the NBA draft. Ernie Grunfeld might have announced Milwaukee's pick at No. 8, but the decision was Michael Jordan's. Draft Rumors: True lies, or a lot of Bull? Connecting the dots between the many trade rumors often can reveal an amazing picture ... if it's real. About 2.3 million households tuned into the ESPN telecast, making it the most-watched NBA draft since 1996. LeBron James didn't need the white suit to stand out Thursday night at the draft. Maciej Lampe, projected to go as high as No. 5, waited an entire round before having his name called. Follow along as ESPN Insider Chad Ford provides analysis of each team's draft selections. Whos left after LeBron? You decide in the NBA Draft Pickem game. Correctly select the first 13 players in the June 26th NBA draft and you could win a trip to NY to attend the NBA Draft 2004. Free to play! You could win $10,000 and a trip to the NBA Draft 2004. Each week, answer a new set of NBA draft-themed trivia, then enter for your chance to win big! Predict the top selections in this year's NBA Draft for a chance to win a trip to NY to attend the NBA Draft 2004! Its free to play, so get in the game before draft day kicks off June 26!